Archie Thompson, San Diego jazz musician par excellence, leans back in the chair of his office in the First Presbyterian Church on downtown San Diego’s 4th Avenue, in a small office space secreted above the chapel in the balcony, next to the pipe organ. The space is small, filled with his computers, a small drum kit, chairs, microphones, cables and assorted recording devices and various instruments and books filling every inch .This is the creative clutter of a busy man. Fashioning a broad smile and looking casually resplendent in golf cap, black tee shirt and jeans, Thompson is a man thoroughly enjoying this time of his life. It’s hard to think otherwise. Article originally published in San Diego Troubadour. Used with kind permission. “You’re the kind of person I’d ‘the world’s luckiest man’” I offer. Thompson leans back in his chair again while the smile grows wider and he folds his hands behind his head. The smile is ubiquitous, freely offered. “Yes, that’s what it feels like” he replies. What strikes you about Archie Thompson almost at once is that his easy-going persona isn’t a veneer, a façade, but the genuine article. Gregarious, cordial, quick to extend the hand, he seems at once intense and sublimely relaxed, a quality he brings to his dates at various restaurants and clubs that feature live music. 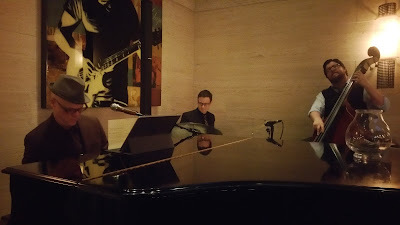 A recent appearance with his trio at Eddie V’s in Seaport Village, an elegant eatery where her performs every Thursday ,Thompson and his trio Jason Littlefield , a melodic and quick witted bassist, and the percussive insightfulness of drummer Charlie Weller livened up the with an set off jazz was the perfect balance of elegance and funk. Firmly rooted in a blues groove, the trio swung mightily through a surprisingly diverse set list, commencing with a riveting adaptation of Cannonball Adderly’s “Work Song”, the Willie Dixon penned Little Walter classic “My Babe” and a very fine reconsideration of Albert King’s “Born under a Bad Sign”. Thompson sweetens the signature riffs with rich, ringing piano chords and short phrases to underscore the humor and the dolefulness of his expressive vocals, often looking up to both Weller and Littlefield as the tempo slows down for a time and then picks up the pace, or breaks into a different time signature. Bass and drums weave suitably tight and organic patterns under Thompson’s piano work, which responds with a continually inventive improvisation. 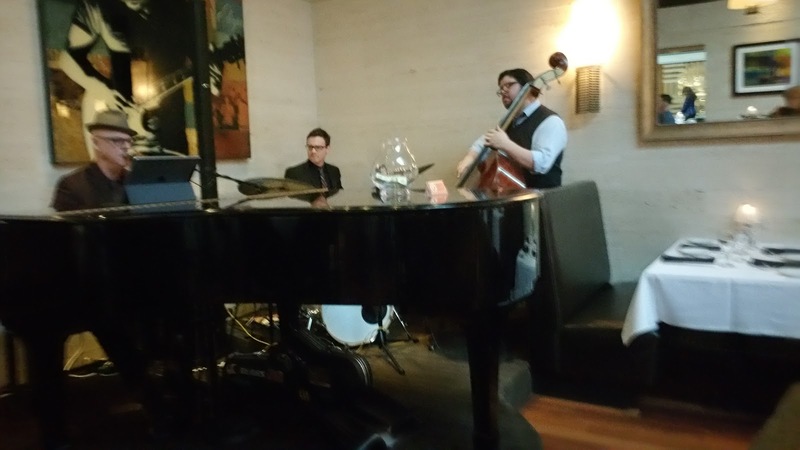 A combination of styles intersect in his playing, with quotes from classical pieces, pop tunes, bits and pieces of melody made part of the enjoyable, rumbling eloquence the trio puts forth. Most notably, the music swings while not losing the grounded grit of the blues. Even on an interpretation of the Turtles pop hit “Happy Together”, a song generally not found in most jazz trio’s book of tunes, these three retained the oldie’s classic arrangement and even excel at bringing forth the song’s signature chorus, the solo section is solid jazz, with a finely composed piano solo from the ever resourceful Thompson over a bass and drums interplay that pushes the tune with a verve only an intuitive grasp of the other’s playing provides. Thompson, of course, is an especially soulful saxophonist with a style that combines the honking grit of Illinois Jacquet and King Curtis (too formative influences he speaks highly of) and the hard bop panache of Nat Adderly and Dexter Gordon. Thompson though is one of those players you make note of, where you can simultaneously hear who inspired him in his playing as well experiencing the personal voice built on the lessons he learned. The combination of Thompson, Littlefield and Weller results in a night of fun, funky, continuously surprising music. Born in San Carlos in San Diego’s east county and a resident most of his life, Thompson grew up in a musical family, with two brothers who were also musicians and parents who supported and encouraged them with their passions. Archie was the youngest of three boys and it was when he was very young their passion music became his. “I started on piano at 6” he recalls,” I’m from a musical family. I am really fortunate, I have two older brothers. My oldest brother, eight years my senior, was a real music prodigy. He had perfect pitch and he was quite accomplished by the time I was born. We realized he had perfect pitch by the time he was in second grade or something like that. I was really fortunate to grow up in that environment, in San Carlos out in East County. We all started out on piano and then we all picked up the horn. I wanted to play the horn, but we had to learn piano first, and thank god for that because it’s t he foundation for theory, harmony. We all took lessons from the same elderly piano teacher who had a classical emphasis. Thompson recalls that the period he spent living in Los Angeles after graduating high school in San Diego was a cornerstone in his decision to make a career as a musician. Thompson often expresses s amazement and gratitude that he’s been able to earn his keep and, in the long run, flourish through creating and performing the music he loves. He is one of those musicians who make you think of the James Brown honorific, “the hardest working man in show biz”. In any event, a visit to his website (www.archiethompson.com) reveals a musician involved in many projects tailored to different audiences, his many permutations evidenced in his principle group The Arch tones, as well as a with vocalist David Stranger called the New Moon Flyer in the vein of Sinatra, Bobby Darin and Nat King Cole that gives tribute to the Great American Songbook. 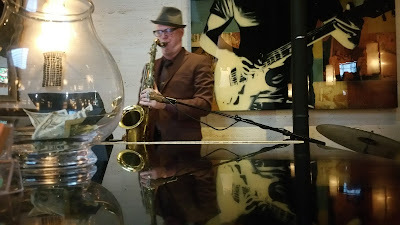 Ever versatile and expansive in his tastes, Thompson also headlines the surf combo Archie T and the Tidesmen, and a cocktail lounge solo piano/saxophone act. Thompson adds to his schedule with frequent work as a producer and songwriter and a busy schedule of regular performances. In addition to the weekly Jazz Vespers services on Saturdays at 4:30PM, , he performs at the elegant U.S. Grant Hotel Saturdays from 8pm to 12am, holds forth with his trio at the posh Eddie V’s in Seaport Village on Thursday , at the U.S. Grant Hotel from 8pm to 12am, and appearing as a solo act four nights a week at Truluck’s in La Jolla . A considerable amount of activity for the working musician, but it’s a full schedule Thompson built from the ground up acting as his own booking agent. It’s a skill he acquired in the earliest days of his professional life. “What was really cool was I was 14 or so I got into a band and not a garage band. I already had a reputation because of my brothers. And I was pretty good on the sax by then and I joined a band with guys who in their early 20s. They got me in the band, probably, because they knew my family got all the gigs. My mom and dad were managing and booked the gigs for a long time by the time I had started to play live. By the time I was 14 I was in a band and out making money. At 16 I was playing night clubs 5 nights a week starting in high school. That was probably not the best place to be for a 16 year old boy, but you get an education that you probably don’t get in a class room. From my older brothers band my dad would go out and be the band manager on site, or my mom would. By the time I came around they were over it. I was the fourteen year old in the band but I was the one was the band leader. We played all the Navy Clubs all over, Camp Pendleton, all the military installations. They all had live music, even over here at Balboa Hospital. We played navy clubs, marine bases, sub bases, church dances, high school dances, after game dances every week, Sadie Hawkins dances. You know live bands in the gymnasium! Thompson is also a prolific songwriter whose songs and instrumental compositions have found a productive and profitable niche in work he’s been commissioned to write for publishers who work in the film industry; particularly in items they call “sound alikes.” It’s clearly something else Thompson gets great pleasure in doing. Thompson has had a checkered music career with regards to the kinds of music he played as he learned his craft both as musician and performer. His words make you think of someone who is glad he played each and every lick of each and every kind of music on his journey to being a full time, flourishing musician. “The first band I got into was around 75-76, right in the heart of the disco era, and I was the sax player and we played a lot of 7os stuff. Tower of Power, Earth Wind and Fire, Average White Band. I loved all that stuff. I always loved Black music. We played rock like Peter Frampton and Doobie Brothers and all that stuff. But we’d throw in some jazz stuff, like Les McCann and Eddie Harris and their song “Compared to What.” But while I was playing that pop stuff I knew I really loved black music and really just got into it, Charlie Parker, Miles Davis and Coltrane. I remember the first time I saw Ray Charles on the Cher Show and he did “Georgia on my Mind” and that was it! So then I really got into Ray, and I was a huge James Brown fan. While other kids were listening to Boston, I was in my room wearing out my James Brown records, as well as Parliament Funkadellic and Coltrane and Pharo Sanders. I was a bit of a freak compared to most high school kids. “I wanted to be a jazz musician. I remember in 7th grade they had a vocational fair where they tried to find your aptitude and what you wanted to be. You would choose your occupation and research it. I wanted to be a jazz musician. Other classmates wanted to be doctors and I remember being told I would make really lousy money and be out at really smoky clubs. I wanted to be a sax player . I loved playing piano and had to keep it up in order to work, especially with the advent of new wave music. there is no saxophone in most of that stuff. I’m a bar musician. With their two children now grown and moved out of their home in San Carlos, Thompson and his wife Trish moved to downtown San Diego a few years ago and enjoy the growing hustle and bustle of an area where the urban experience is constantly improving and becoming more exciting for both San Diegans and visitors. As with any person who has had the good fortune of making a decent livelihood doing what they love, Thompson’s ability to thrive as a working musician, producer, and songwriter has much to do with taking a realistic assessment of the city he wanted to work and live in. “San Diego is a good gigging town,” he says, “There are a lot of gigs here. But is it a great jazz gigging town? Here’s where the line gets drawn, though. True jazz musicians look down upon the working musicians. When I play most of the time, it’s to enhance the atmosphere. My niche is upscale lounge and fine dining venues. People are not there for the music, they are there for a thing the establishment offers and my job is to enhance the environment. Basically, I’m a liquor salesman. In the 70s and into the 80s San Diego had a number of clubs with solid jazz policies, such as Elario’s and Chuck’s Steak House in La Jolla, the Catamaran Hotel in Mission Beach and the Crossroads Bar in downtown’s Gaslamp District, all of which are closed. Founded in 1860, the Church has been a constant in downtown life, witnessing both growth and decline in its congregation as downtowners moved to the suburbs and subsequent growth again. Pastor Andrews , witnessing the rapid growth in the downtown area over recent years and aware that there was a diverse population of citizens ranging from the upscale , middle income, seniors on fixed incomes and the too- many who make their homes on San Diego streets, became interested in establishing a jazz service, a Jazz Vespers. Such services have been long established in Detroit, Kansas City, Chicago and Los Angeles, usually scheduled on a monthly basis. The San Diego Vespers became that rarity, a religious jazz service presented weekly, every Saturday at 4:30pm in the Churches 4th Avenue Chapel. Around 2011, Pastor Andrews began asking musical friends and congregation members if anyone knew of local musicians who would be the best fit to organize and conduct the music for ongoing jazz service. Thompson’s name was mentioned, and Pastor Andrews went to see he and his band at the belated Croce’s restaurant and jazz club on 5th Avenue in downtown’s Gaslamp District. After the set, Andrews approached Thompson. They spoke and Andrews made his proposal. Then Jerry said ‘It’s on a Saturday night, and Kevin said ‘Oh yeah I do’. Jerry came down to Croce’s where I was playing and asked me there. We did a few pilot programs in the spring 2011 to get some feedback from some folks to see if it was going to work , and after that we started to do Jazz Vespers in September of 2011 year. We received a grant from the Presbytery for Jazz Vespers a couple of years after that which was a nice grant, we received $45,000. With that we recorded and released the three Jazz Vespers records. We might do another record. To those words, I might add that the quality brings to his live gigs, a combination of imagination, technique and contagious joy that impresses and moves the listener and which elicits the best work from the superb roster of musicians he works with over his broad swath of projects and collaborations, is what music should always be: expressing the inexpressible in terms of the unforgettable.